Begging for originality ? 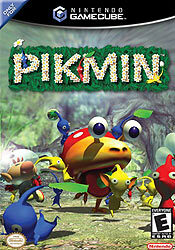 Pikmin is what you need. Out of a difficult concept (controlling a character who controls himself as much as one hundred characters who can perform different tasks ! 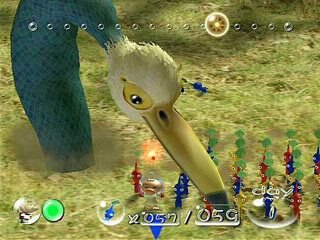 ), Nintendo managed to make an addictive game very simple to handle. 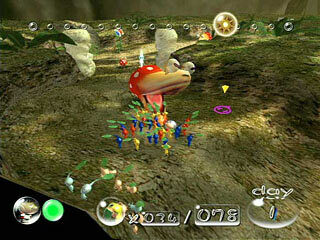 Every time you learn a new action to improve your control over the Pikmin, it just feels natural. 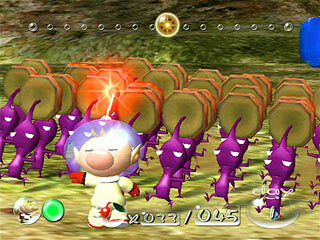 Even spliting a hundred Pikmin in groups according to their color is just as easy as snapping the fingers. 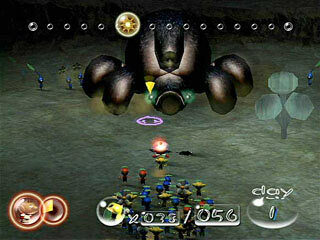 And it's very exciting too, like controlling a little army. 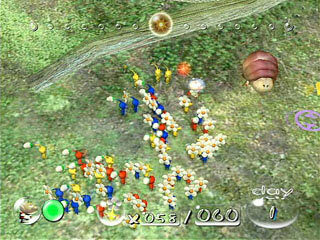 Yes, you fight enemies and your Pikmin might die, but finally, the comparison with a military unit is most unappropriate as Pikmin is all about nature. The Nintendo spirit in his most pleasant shape: it's nice without being kiddy, it can be violent without anything to do with human cruelty. It's like the wild life, some creatures fighting some others for their survivance, without the ugly aspect. 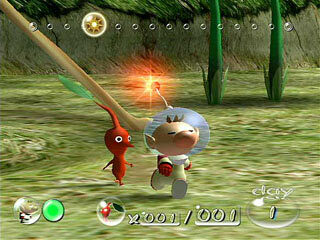 While some games just make fun with butchering, Pikmin makes you feel some affection for those friendly little guys who are so faithful that they will sacrifice themselves for you. 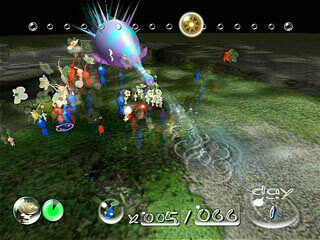 Pikmin is a challenging game too, you have to think new strategies for new types of enemies and environments all the time. How to get this piece of ship ? How to go beyond this door ? It's very pleasant to be able to have the choice of different locations to investigate as well. 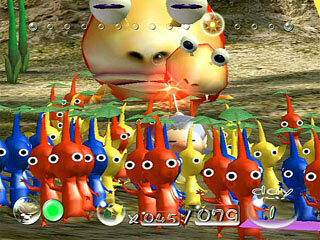 Pikmin is a great game, at first you might be skeptical, but once you tried it you can't stop. 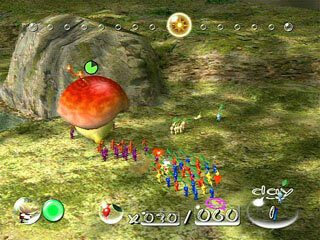 The natural landscapes, the funny design of all the creatures, the smooth control, the adventure, the cute Pikmin, everything for a wonderful and relaxing gaming experience in Nintendo's best way. 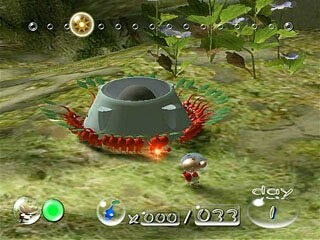 "Shigeru Miyamoto, the world-famous creator of Mario and Zelda, has been waiting for years to develop a game like this. 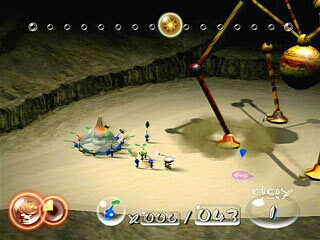 When a space traveler crashes in a strange world, the Pikmin - a curious race of plantlike creatures - help him explore, fight off savage predators and assemble the scattered pieces of his spaceship. 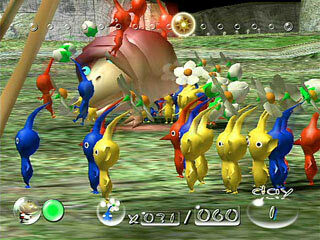 The Pikmin look like flowers when they're in the ground, but they can move freely and work together. Time is running out on the space traveler's life-support system, though, which means you'll have to race against a Majora's Mask-like deadline. 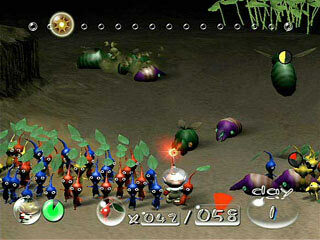 Controlling a hundred Pikmin at once is an experience unlike any you've ever had in a video game!"